The course consists of 5 classes, each offered on multiple dates. 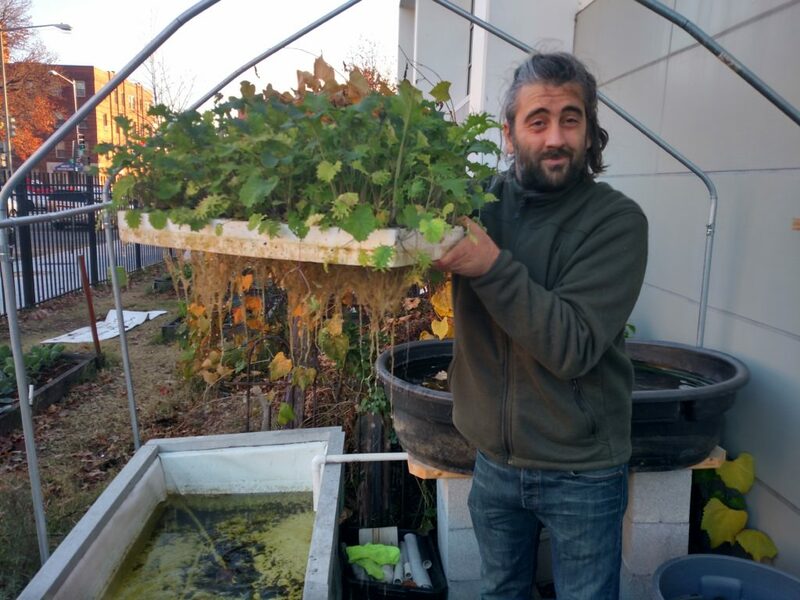 Participants that attend all 5 classes will be awarded a Small-Scale Aquaponics Training Course Certificate of Completion from Anacostia Aquaponics. 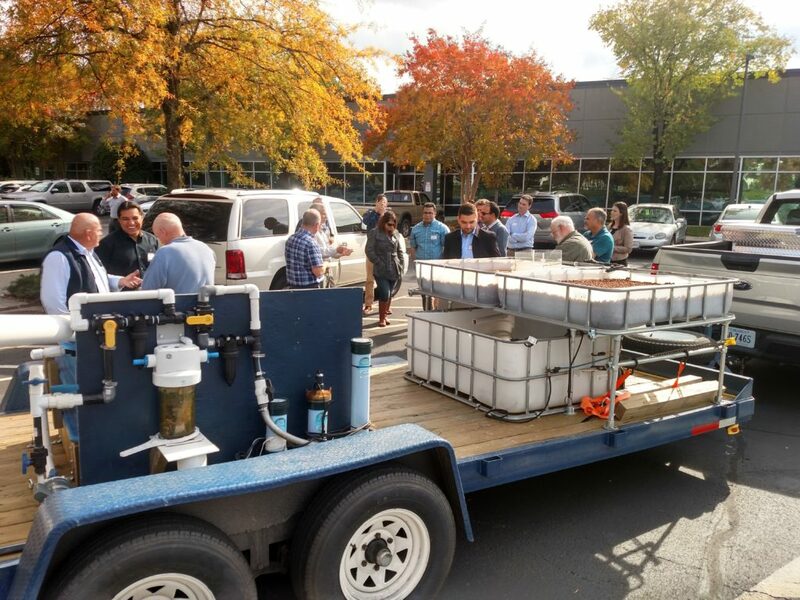 The aquaponics trailer was a highlight of the Potomac Aquaponics Conference. This trailer is a mobile educational tool that travels all over Virginia, which is why it is the perfect example for the next issue we identified at the conference: Education & Outreach. We need to teach more people about the benefits of aquaponics, so that more people enter the industry and consumers understand the benefits of aquaponics produce. This will need to be a large effort undertaken by the entire aquaponics community. 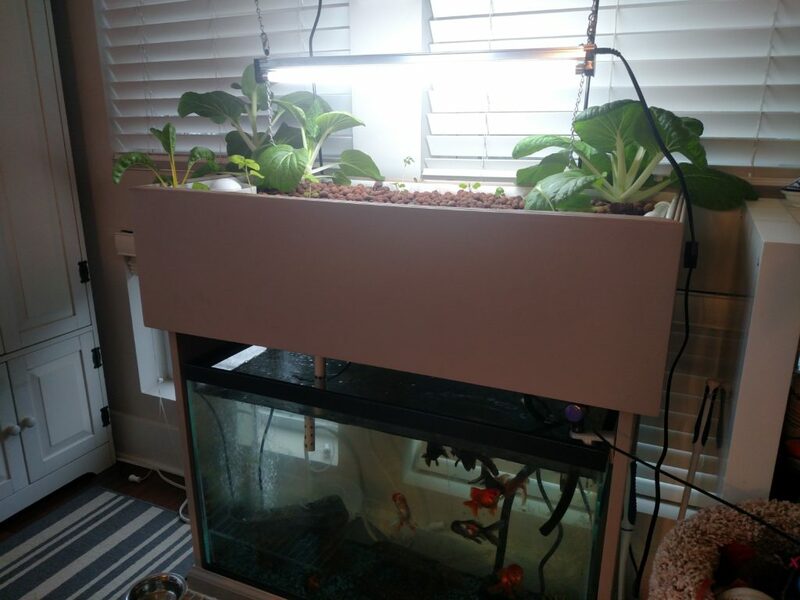 Our Hootie 2.0 Indoor Aquaponic System was growing some bok choy. 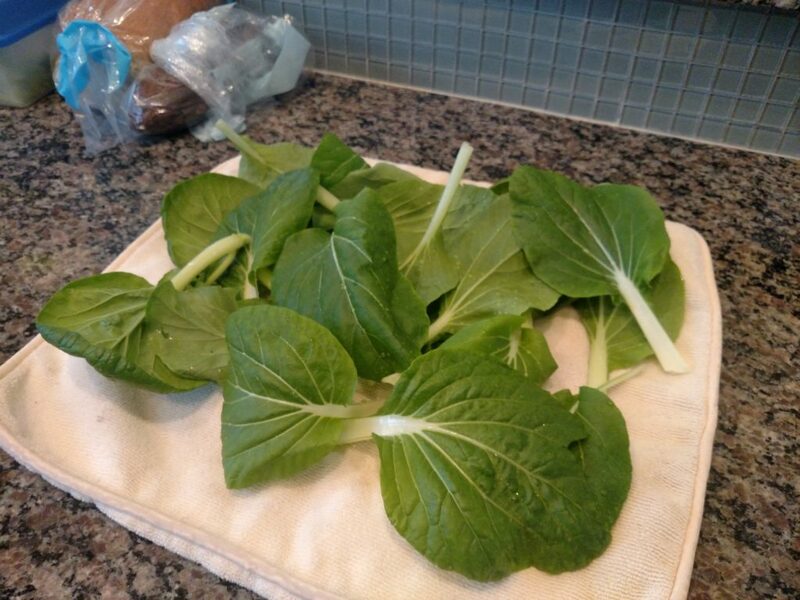 One-hundred percent of the nutrition for the bok choy came from nutrient-dense fish water continuously cycled from below. Red wiggler worms in the media bed help with nutrient-cycling. Below is our harvest, with no pesticides, fertilizers, or antibiotics. The only input is fish food! And fish and worms did all of our gardening for us. And it was very tasty and crunchy bok choy! We are working on some improvements to the Hootie 2.0, including an LED light, rather than the current T5 fluorescent. 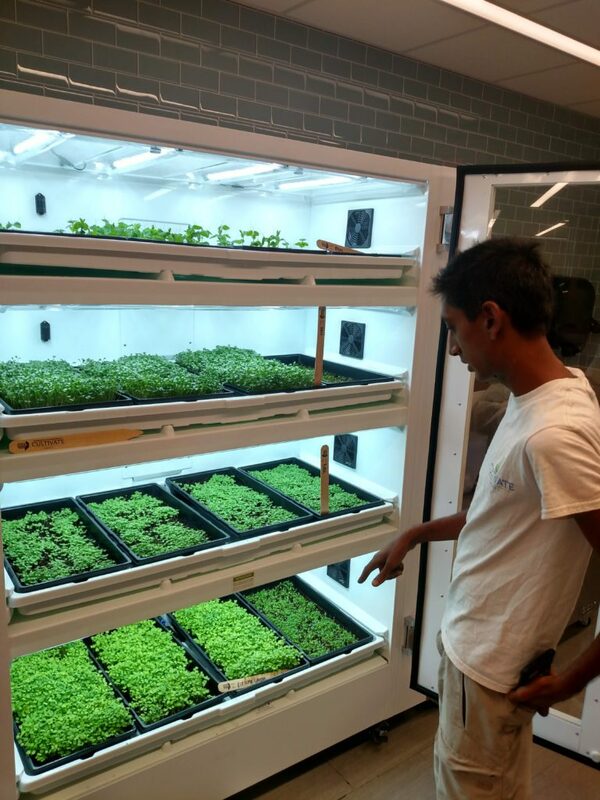 We recently worked on planting and harvesting vertical hydroponic systems at the new Fannie Mae office building in downtown, DC. These systems make the best use of space by stacking hydroponic shelves vertically. All four levels are connecting to one common reservoir, which is directly connected to the DC water system. The hydroponic system is from the Urban Cultivator. Pictured here is Niraj Ray from Cultivate the City. This past Summer we experimented with a prototype vertical aquaponic system – The Cultivator 1.0 – on the Cultivate the City rooftop farm by H Street, NE. Re-used food grade 55-gal barrels cut in half served as containers for the fish tank, grow bed, and sump tank. The Cultivator 1.0 is intended to make the most of vertical space in our dense urban environment by stacking the containers. The vertical arrangement also makes water-flow more convenient. Was the Cultivator 1.0 successful? stay tuned to find out! 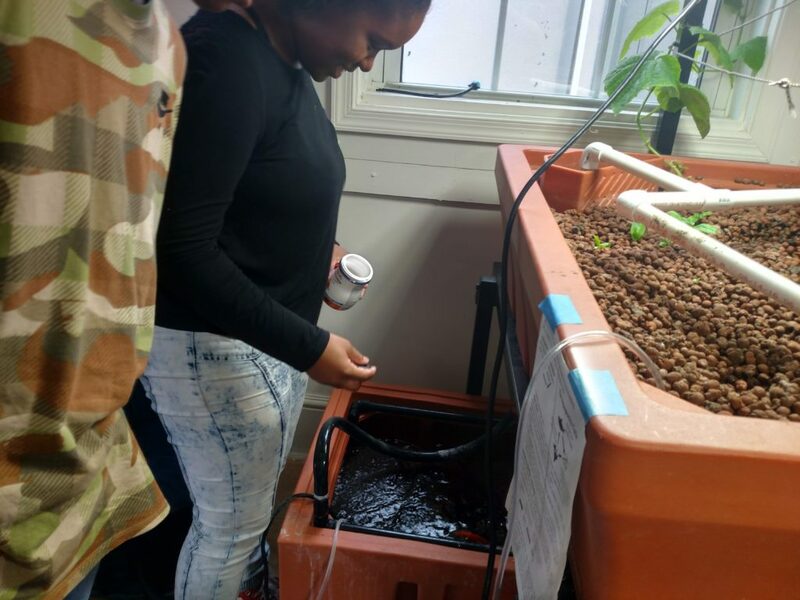 Summer 2018 — students in the IDEA PCS Summer Bridge Program learned about aquaponics as an efficient and sustainable way to produce food in an urban environment. 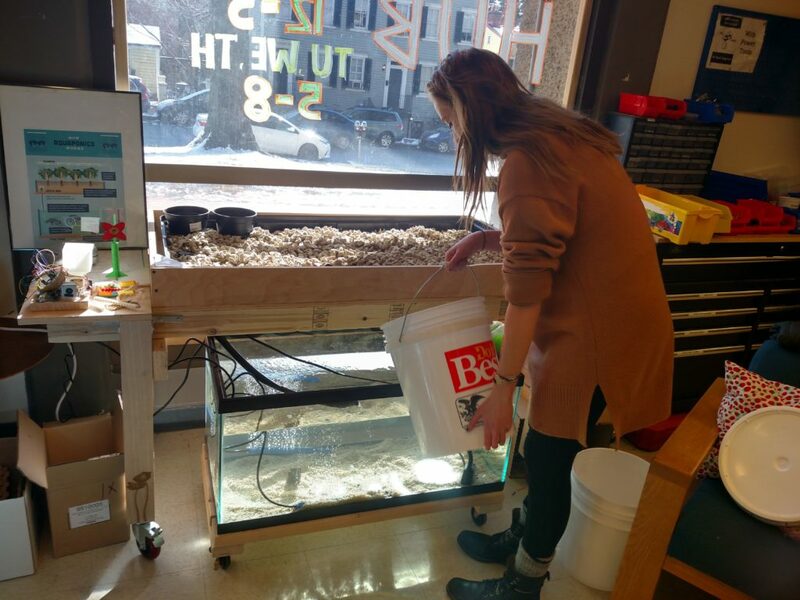 Students helped out by feeding the fish in the 150-gallon aquaponic system. James and William are retro-fitting an existing aquaponic system to improve water flow in the media bed. Without the extended pipes, one side of the bed would not have adequate water circulation. This could lead to poor water conditions. In the background we see a hydroponic media bed already growing large amounts of basil and tomatoes. This is because we are still far from an adequate stock of fish to produce enough waste/fertilizer in the aquaponic system, whereas in hydroponics the appropriate nutrients can be dosed immediately. 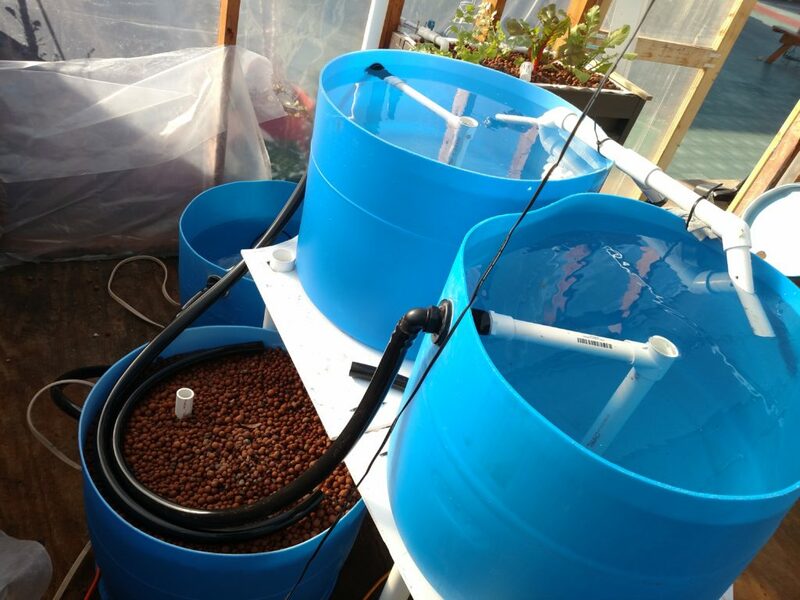 In the hydroponic system, James’ and William’s improved water circulation is not as important because there is not nearly as much organic material to risk foul conditions. 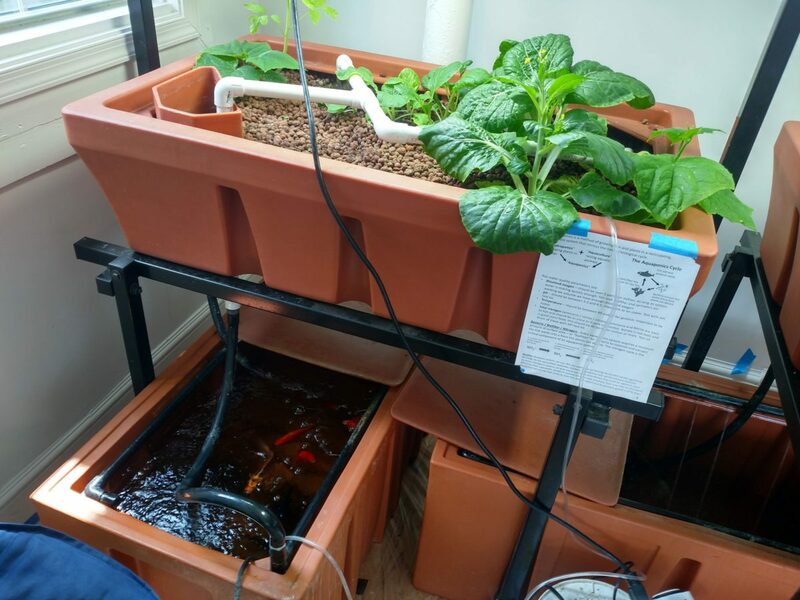 It’s important to understand the trade-offs between aquaponics, hydroponics, traditional soil agriculture, and other growing methods. 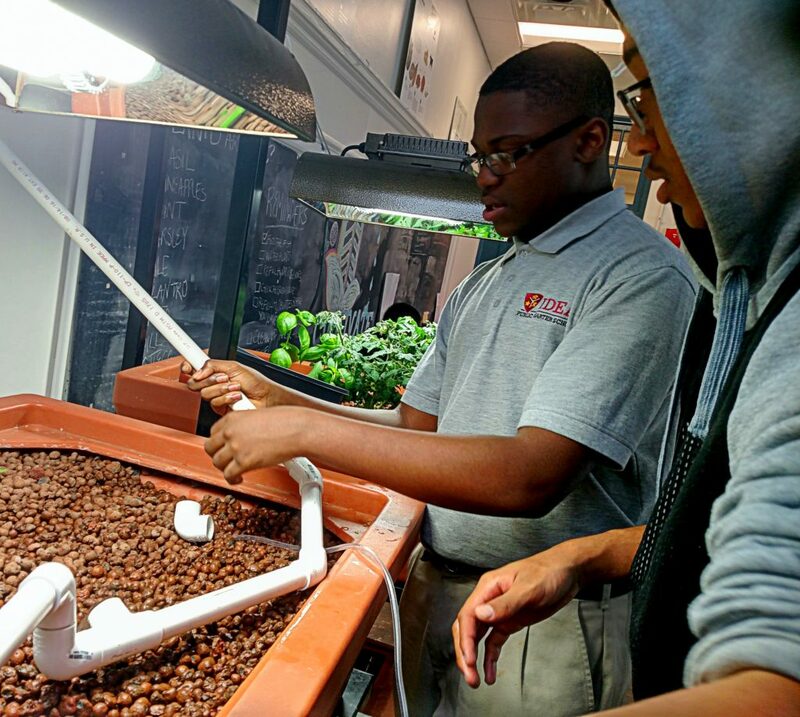 For IDEA Public Charter School, the aquaponic system is an invaluable STEM education tool to teach students about the ecosystem of fish, plants and bacteria. But it is important to note that depending on circumstances, aquaponics is not the answer for every growing situation. A 15-gram goldfish named Jay Wright is the first resident of the Georgetown University Maker Hub aquaponic system. 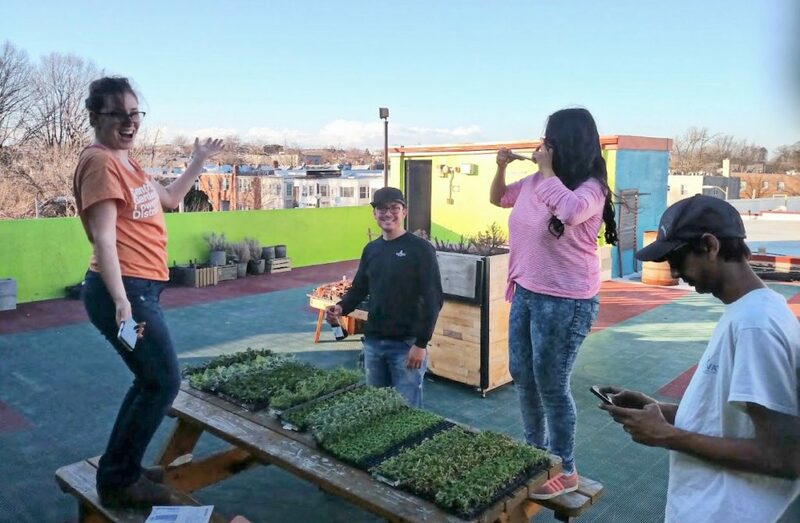 We were very excited to kick off the growing season on the Cultivate the City rooftop last week. Time to get planting! Author AdminPosted on March 13, 2018 Categories aquaponic systemsLeave a comment on It’s Growing Season!